Schalke meet Bayern Munich as the Bundesliga returns on Friday night, and the two national team colleagues are set to line-up on opposite sides of the pitch. 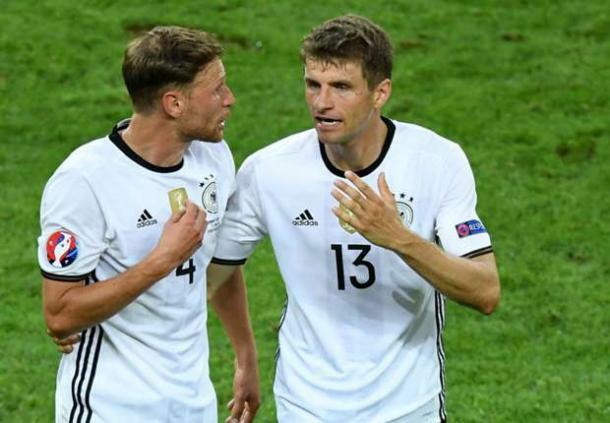 After spending the last week together with the Germany national team, Benedikt Höwedes and Thomas Müller have been exchanging words as they prepare to come against each other in the Bundesliga on Friday night. 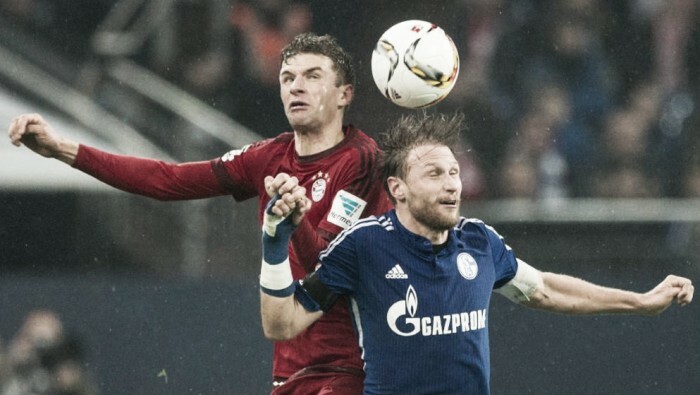 Speaking to German newspaper Bild, the pair exchanged taunts ahead of the game, where Höwedes’s FC Schalke 04 will host Müller’s Bayern Munich at the Veltins-Arena. Their two sides go into the match following contrasting fortunes on the opening weekend. Bayern thrashed Werder Bremen 6-0, but Schalke lost 1-0 to Eintracht Frankfurt in their first league match under Markus Weinzierl. "I do not fear Müller," said Höwedes. "It's not like I am playing against him by myself.” He admitted though that Schalke would have to play significantly better than they did two weeks’ ago. “We all know Bayern are the best team in Germany,” he said. However Müller has also responded. "Benedikt and I have been exchanging plenty of words over the past few days," he revealed. Müller has only been on the losing team twice against Schalke, both in the 2010-11 season. Höwedes played in both games and also appeared from the bench in a win in 2009. Bayern won both games last season, winning 3-1 in Gelsenkirchen, with a goal from Müller, and 3-0 at the Allianz-Arena, a game neither man played in. After going through UEFA Euro 2016 without a goal, Müller returned to form for Die Mannschaft with two goals and an assist in their opening 2018 FIFA World Cup qualifier against Norway on Sunday night. "I never doubted my finishing skills,” he said. “There are always moments where things don't work out but I am calm and confident again." Both also commented on his first goal, which he was able to clumsily score after falling over with his first attempt. “That was a classic,” said Müller, with Höwedes adding that “I had already told him in the dressing that he could not make a more typical goal with this name." Quotes via Bild and Goal.